A rhyming picture book with humor and heart that's a wonderful bedtime addition for the "little monster" in your life. Includes illustrations from bestselling author/illustrator Ashley Spires of The Most Magnificent Thing. Even monsters have to go to sleep. But before little trolls turn out the light and werewolves settle in to dream, there's fur to be brushed, pajamas to find, and moons that need howling. So grab your cuddly critter and snuggle in for this new bedtime tradition. 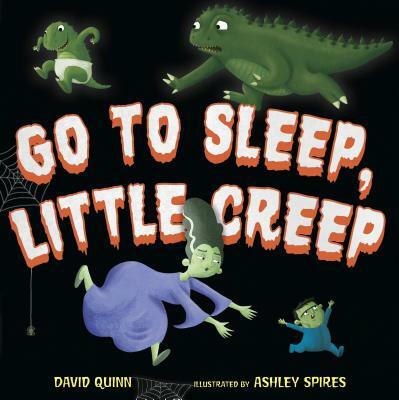 Debut storyteller David B. Quinn teams up with bestselling author/illustrator Ashley Spires to create a wondrously funny and supremely sweet picture book sure to charm little creeps who aren't quite ready to fall asleep. Go to Sleep, Little Creep is the first children's picture book from David B. Quinn, who has spent the past 25 years creating (mostly horror) comics and trans-media projects for Marvel, Disney, DC, image, and more. But his real job is Diane's Husband and Oliva Rose's Dad. You can follow him on Facebook and on Twitter at @DavidBQuinn. Author and illustrator Ashley Spires grew up in Tsawwassen, BC, and after stints living in Toronto and Saskatoon, she now lives in Ladner, having made an educated decision to never move from BC again. She is the creator of the Binky the Space Cat series of junior graphic novels, which have earned her numerous awards, including the Silver Birch Express and the Hackmatack. Her picture books, including Larf, Small Saul, and The Most Magnificent Thing, are known for providing readers, young and old, with a good laugh. When not drawing, she is often jogging with her dog, Gordon, or wrangling her three cats, Penny, Fran and Gracie. You can follow her on Facebook, on Twitter at @ashleyspires, or visit her at ashleyspires.com.